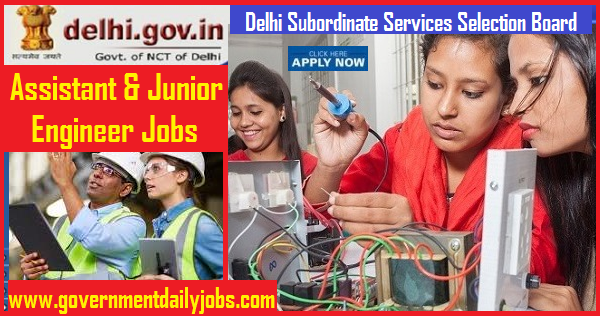 NOTIFICATION: Delhi Subordinate Services Selection Board (DSSSB) (Govt. of Delhi) inviting online applications for filling up 264 Group B & C vacant posts of Assistant Engineers (AE) & Junior Engineers (JE) in Civil & Electrical Trades from eligible and interested willing candidates. It is latest & good information for unemployed personnel those who are looking for Technical Jobs in Government sector & other organizations. Job seekers, who wish to apply for these vacancies regarding DSSSB Recruitment 2019, must have passed Graduation /Diploma or its equivalent in Civil/Electrical branch. Applicant’s upper age should not exceed 27/30/32 years. As per Govt. rules age relaxation is applicable to all reserved category candidates i. e.SC/ST/ OBC/ PWH/Ex Servicemen/Women candidates etc. NO OF POSTS: 264 Group: ‘B & C’ vacant posts of Assistant Engineers (AE) & Junior Engineers (JE) in various trades in Delhi Subordinate Services Selection Board (DSSSB). 1. Post Code:1/19-Assistant Engineer B-(Electrical) MCD: 07 posts. 2. Post Code:2/19-Assistant Engineer B-(Civil) MCD: 13 posts. 3. Post Code:3/19-Junior Engineer C-(Civil): 103 posts. 4. Post Code:4/19-Junior Engineer C-(Electrical) MCD: 20 posts. 5. Post Code:5/19-Junior Engineer C-(Civil) NDMC: 33 posts. 6. Post Code:6/19-Junior Engineer C-(Civil) NDMC: 61 posts. 7. Post Code:7/19-Junior Engineer C-(Electrical) NDMC: 27 posts. 1. Assistant Engineer (Electrical/Civil): A passed of Degree in Electrical/Civil Engineering from any recognized University or equivalent with 02 years professional experience. 2. Junior Engineer (Electrical/Civil): A passed of Degree/Diploma in the concerned subject from any recognized University or equivalent. 1. Assistant Engineer: Rs.9300-34800/- + Grade Pay Rs. 4600/- (pre-revised). 2. Junior Engineer: Rs.9300-34800/- + Grade Pay Rs. 4200/- (pre-revised). • Junior Engineer – Not exceeding 27 years. • Assistant Engineer (Electrical) - Not exceeding 32 years. • Assistant Engineer (Civil)- Not exceeding 30 years. AGE RELAXATION: As per Govt. rules age relaxation is applicable for said post to all reserved category candidates for DSSSB Recruitment for 264 Assistant Engineers (AE) & Junior Engineers (JE) 264 Jobs. REQUIRED APPLICATION FEE: For said vacancy a non- refundable application fee is to be paid by the candidates as per rules. General & OBC candidates have to pay Rs. 100/- through SBI e-pay. Challan will be generated online. Women candidates and candidates belonging to Schedule Caste, Schedule Tribe, and Physically Handicapped & Ex-serviceman category are exempted from paying Application fee. POST RESERVATION: All reserved category candidates ie. SC/ST/OBC/ PWD/ Women/Ex Servicemen/Widows etc (as applicable) are being selected for said post/s as per existing Govt. policy/rules. केंद्रीय कर्मचारी आयोग ने विभिन्न जूनियर इंजीनियर की भर्ती हेतु अधिसूचना जारी की है इच्छुक उम्मीदवार यहाँ ऑनलाइन आवेदन कर सकते हैं आवेदन करने से पहले सम्पूर्ण जानकारी यहाँ से प्राप्त करें- Various vacant posts of Junior Engineers in various disciplines through Junior Engineers (JE) Examination 2018 through Staff Selection Commission (SSC). LAST DATE TO APPLY: 25-02-2019. SELECTION PROCESS: Applicants who are screened for applicability /eligibility are being selected as per organization policy/rules depending on the basis of their performance in One Tier and Two Tier examination scheme and Skill Test, wherever applicable. ENQUIRY: Help Desk No.- 011-22379204, 011-22370307. HOW TO APPLY: For said posts (DSSSB Recruitment 2019 of Assistant Engineers (AE) & Junior Engineers (JE) 264 Posts) eligible, willing and interested candidates may apply through online mode at official website up to up to last date. Applicants must retain a hard copy of application form for future reference. 1. Before applying online application candidates must have valid E-mail ID, scanned copies of photograph and signature, contact number. 3. Navigate to Vacancies section. 4. Select the post you want to apply for. 5. Now click on “Apply Now” link. 6. Read the instructions and click on Apply Online link. 7. Fill in application form with filling all marked details. 8. Make the application fee payment as per category. 9. Upload your recent photograph and signature. 10. Verify details and submit application form. 11. Take a print out of system generated application for future reference. CONCLUSION: Delhi Subordinate Services Selection Board (DSSSB) New Delhi invites online application for the recruitment of 264 vacant posts of Assistant Engineers (AE) & Junior Engineers (JE) in various trades on regular basis from Indian residents who are eligible & interested; candidates can apply through online application. LAST DATE TO APPLY: 01-03-2019 for DSSSB Recruitment 2019 Junior Engineer and Assistant Engineer 264 Jobs.